Entertainment giants, tech startups and pizza shops are stepping up to support the grieving Las Vegas community. Dozens of people were killed and more than 500 were wounded in a horrific gun attack Sunday night at a country music festival in the city. 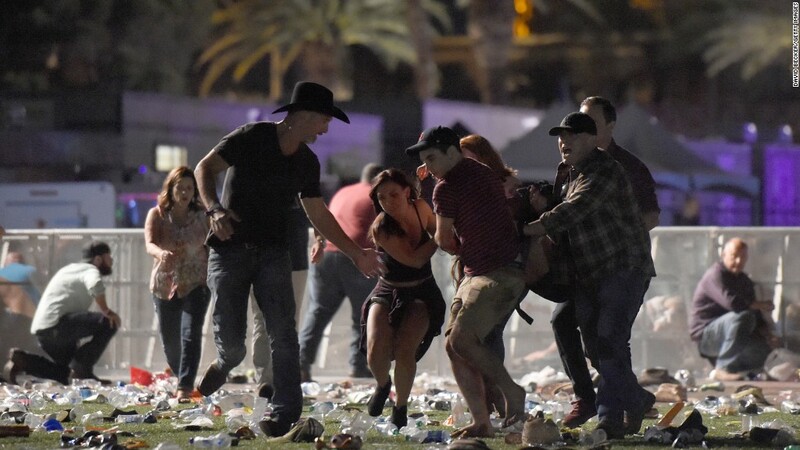 It's the deadliest shooting in modern American history. The multibillion-dollar mixed martial arts league has strong ties to Las Vegas. It will donate $1 million to families of victims of the shooting, spokeswoman Isabelle McLenmore said. UFC's headquarters are in Las Vegas, and the city is home to many of the league's fighters and personalities, several of whom are also promising support for victims. Comedian Joe Rogan, a UFC commentator, tweeted that all proceeds from his Friday show will be donated to the Las Vegas Victims Fund. A local mixed martial arts gym, Syndicate MMA, is hosting a benefit where UFC fighters Roxanne Modafferi, Forrest Griffin and others will teach fighting techniques. All proceeds will go to people affected by the shooting. Related: Las Vegas is America's tourism capital. What now? MGM Resorts International (MGM) is giving free rooms at its Bellagio hotel to victims' family members and coordinating their travel through Southwest Airlines (LUV), Las Vegas police said Monday night. Circus Circus, another MGM property, has provided space to the American Red Cross to set up a temporary headquarters for the local community. The gunman in Sunday's attack was staying at MGM-owned Mandalay Bay Resort and Casino. He fired on a crowd of people from the 32nd floor of the hotel. Regional airline carrier Allegiant Air (ALGT) is offering free flights for victims and their families. "If you or your family members were affected by what happened ... we want to help," Allegiant said on Facebook. "Whether you need to fly to or from Las Vegas ... we will do what we can to help you." The ride-hailing companies are offering free rides to and from certain blood donation centers, hospitals and relief centers. Uber said its offer is for rides worth up to $50 through the end of Tuesday. Lyft is providing two rides per phone number, capped at a maximum of $40 per trip. In the immediate aftermath of the shooting, Domino's Pizza (DMZPY) delivered free pies to police and first responders, as well as to hospital workers and folks in waiting rooms. "There are countless people working to help others," a Domino's spokesman said. "We can do our small part, and provide them something to eat." -- Wayne Sterling contributed to this report.